Following on, from my review of Tesco’s Cleansing Wipes, I thought I’d do another review of a product that I’m currently using, in my “diet” of not using any Simple products at all. 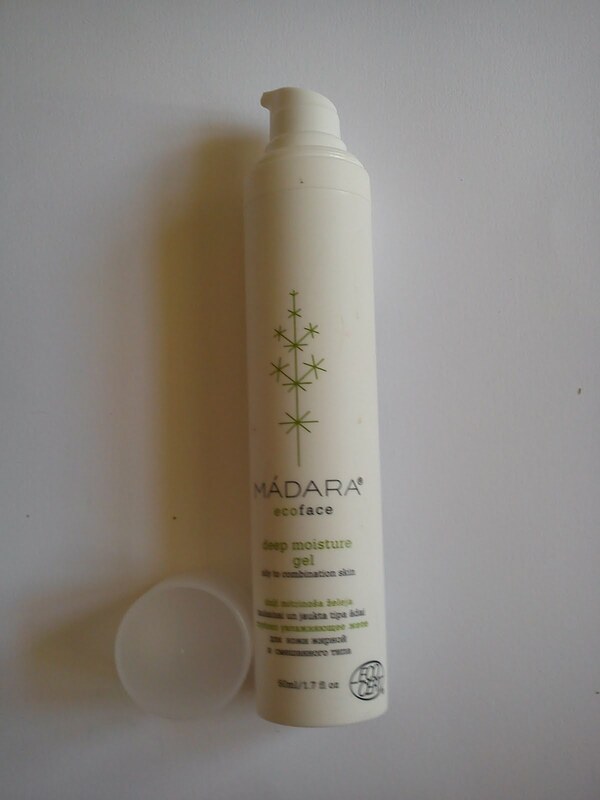 So, I’m going to be talking about the Madara Deep Moisture Gel. I was actually sent this product a couple of months ago, to try out because I have oily skin, but I’ve only just had the chance to really test it out. About Madara: When I was approached to try this product, I had honestly never heard of Madara, but I was keen to try it out, because the product was natural, and of all the products I’ve tried for my oily skin, natural stuff isn’t really an area that I’ve ventured that deeply into. That wasn’t a deliberate thing, but I guess when you’re learning about products, you have to start with what is immediately at hand, and unfortunately, natural-based products aren’t always the easiest or cheapest products to get your hands on, especially not when you’re on a serious budget. Delving Deeper: Most of us have a fairly rough idea of what our skin type is, but just in case, there is a Skin Type Test at the front of the booklet, to help you figure out, with more certainty, which you have. And, from your Skin Type, there is a really in depth diagram, showing which products suit each type of skin. The types of Skin are: Oily to Combination, Normal to Combination, and Dry to Very Dry. The diagram suggests which products to use to: Cleanse, Tone and Moisturise (Day). And finally, suggests two products to use, no matter what your skin type is, for night time, and for when your skin is dehydrated. I found this really useful, because so many brands expect you to know what products are for what skin type, and not all of us are that knowledgeable about these things. Anyway, getting back on track, the Deep Moisture Gel, is recommended for oily to combination skin types, during the day. If you have normal to combination skin, they the Deep Moisture Fluid will be better suited to your skin, whilst the Deep Moisture Cream is more suited to dry skin. The fact that the product is a completely different type of product, for each skin type, was really nice, because it really made me think about what each one does to the skin, and just reiterates my existing thought that cream moisturisers are just too heavy for my skin. Packaging: As someone accustomed to using moisturisers that come in tubes that you squeeze to get product out, I found it quite refreshing to use a Pump-action one. It made it a lot easier to mentally regulate how much product that I squirt into my hand. I don't know about anyone else, but with squeezy tubes, I always end up using too much moisturiser. First Impressions: The first thing that I noticed about this Gel, is how watery the product is, as you can see from the two images. 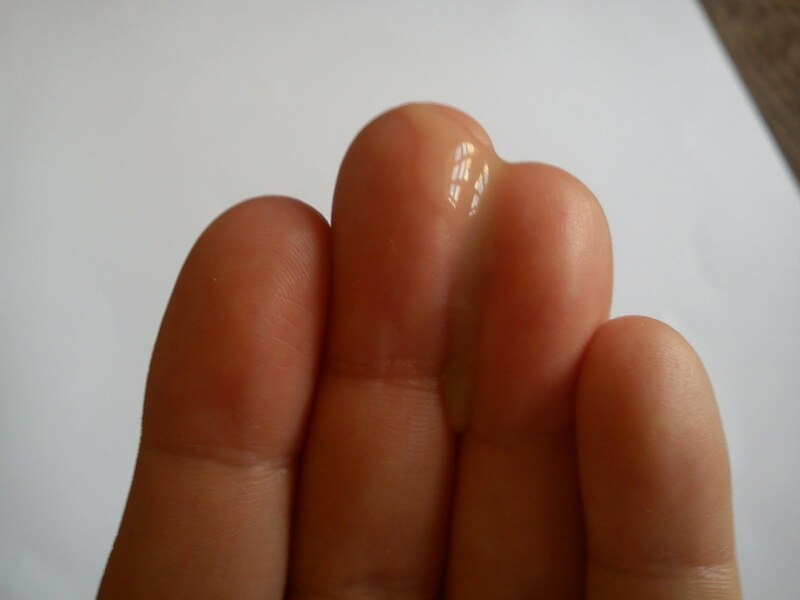 This first photo was taken just after I squeezed the gel onto my fingers. And this second photo was taken barely 20 seconds later. It really didn't take long to trickle down my fingers. And when I applied it to my face, my skin absorbed it pretty much straight away, which is unusual for a moisturiser, because my skin generally doesn’t absorb moisturisers that quickly, unless I’m going through a phase of having really dry skin (which doesn't happen that often)! Smell: The second thing I noticed about this product was, of course, the smell. Unlike some natural products that I have tried, like Lush which I personally think smells a little bit artificial, at time, this genuinely smells natural. It isn't a chemically, fragrance-type smell, instead it's more like a fruity, rustic kind, with hints of what smells like banana and orange. Whilst, at first, I really didn't like the smell, because it doesn't have that instant mmm-ness that a lot of popular products have, I found myself appreciating the freshness of it. And my oily skin: I wouldn't say that this is a wonder miracle cure for oily skin, but it does feel nice and soft after using it. I don't really have that much else to say about it, to be honest. I'm always dubious of something that claims to tighten pores (is that really even possible? ), but it does reduce to initial appearance of shine. Would I buy this? At £23, it is very expensive to the type of budget that I work to. Neverthless, as a product, I do like it in the sense of naturality and the smell is really gorgeous, but I'm not entirely convinced that it's doing that much for my skin. But, if I learnt one thing from this product, it is that I should not be using cream-based moisturisers as they just drown my skin. I'll definitely be finishing the product, and I'll have to see, after I've been using it for a much longer period, if it helps combat my breakouts. To find out more, about this product and everything else that Madara has to offer, check out their website.